Step 1 Heat a grill over medium-high heat. Slice each chicken breast on the bias into three crosswise pieces. With a mallet, pound each piece between two pieces of plastic wrap to one-fourth-inch thick. Season each piece lightly with salt and pepper. Lightly oil the surface of the grill, and place the chicken on the grill. Grill each piece about 2 minutes on each side, until cooked through. Remove and set aside in a warm place. Step 2 In a medium saucepan, heat the oil over medium heat until warmed. Add the garlic and cook, stirring constantly, until the garlic just begins to color, about 2 to 3 minutes. Remove from the heat. Step 3Add the walnuts, pomegranate molasses and brown sugar and stir to combine. If the mixture is too thick, add just enough chicken broth until thin enough to stir. Step 4Return the pan to medium heat. Heat the mixture, stirring in additional chicken broth just a little at a time, until the mixture has a sauce-like consistency (it will be thick but pourable). The sauce should be dark. The sauce should have a nice balance of sweet and sour flavors, but it can be adjusted with a little extra brown sugar or pomegranate molasses. Pour the sauce over the chicken and serve immediately. Extra sauce can be saved for another use. In Recipes-list.com we have selected the most viewed recipes from category - Grilled Main courses Quick and easy . Enjoy the best recipes specially selected for you! 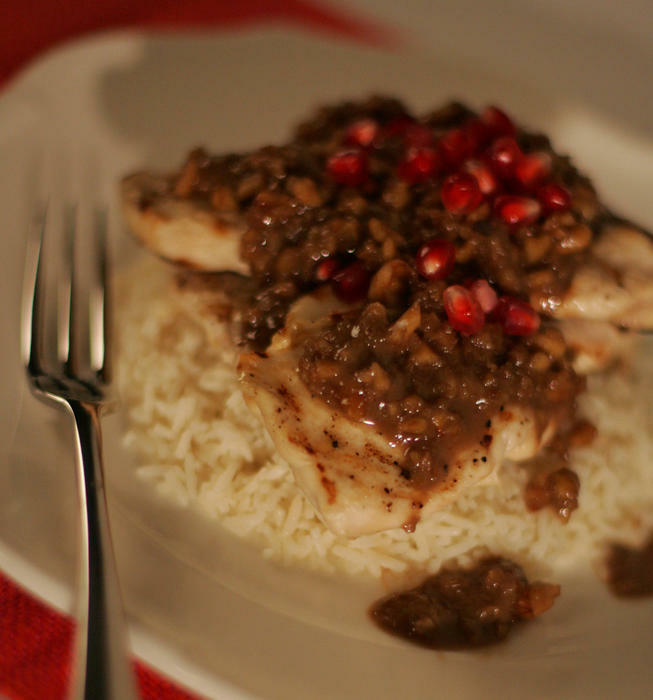 Cayenne Cafe chicken with pomegranate-walnut sauce is the right choice that will satisfy all your claims.